Lane County, dominated by Eugene, is found in the southern area of the Willamette Valley. As you drive around the countryside, you’ll observe wineries and farms dot the landscape. You’ll also discover that it’s the home of numerous covered bridges and several waterfalls. 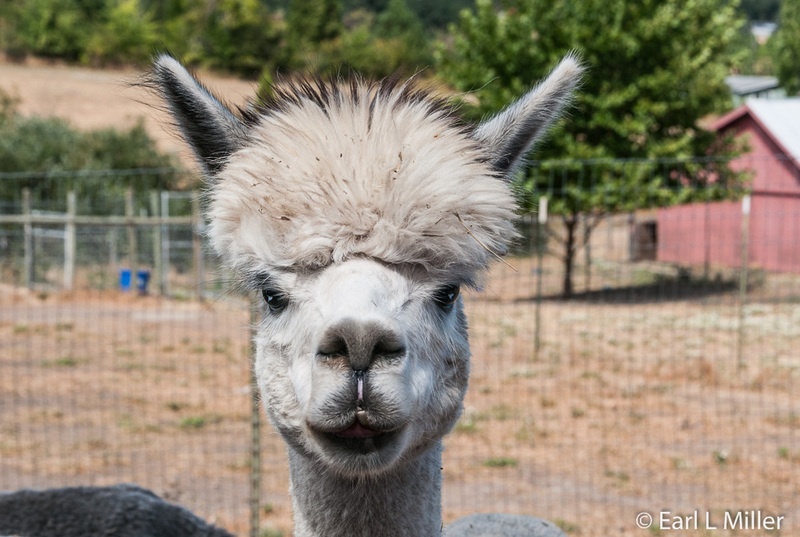 We had driven past several alpaca farms when we were in Woodburn for two months, and I had a burning desire to visit one. 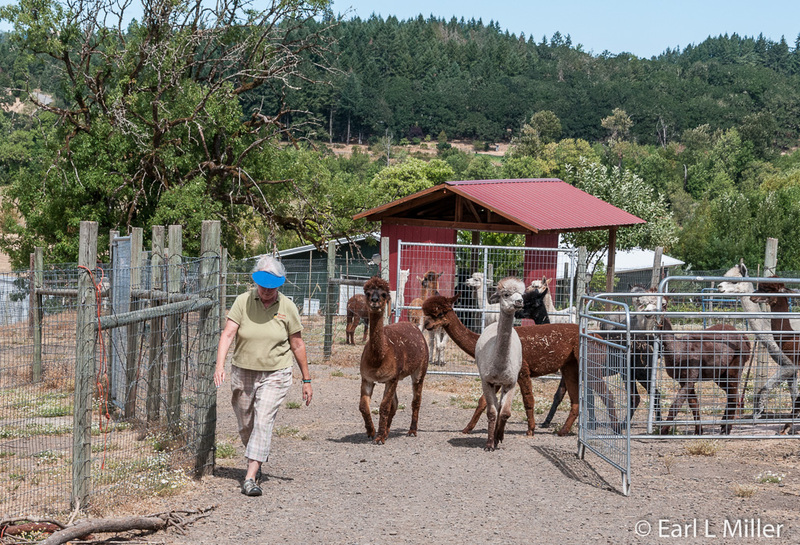 Fortunately, Aragon Alpacas, owned by Ann and Mike Dockendorf, invited us for a visit. It was an opportunity to observe these wonderful animals and watch Ann spin their fiber at their farm’s shop, A Spinner’s Barn. The farm is located in south Eugene. We learned alpacas are New World Camelids, from the Andes. They resemble llamas as well as camels without humps, especially when alpacas have been recently sheared. Alpacas have shaggy necks and camel-like faces with thick lips, pronounced noses, and long ears. Their eyes are black or dark brown. They’re easily domesticated with gentle personalities, but being petted, except for their neck, is not among their favorite activities. They are herd animals and like to be with other alpacas. For breeding purposes, Ann keeps her males and females separate. She has two pastures for them and they change places daily about mid day. Nightly, the girls return to the barn, built before 1900, while the boys return to a low, long building. Alpacas are raised for their fleece also known as fiber. It comes in 22 natural shades ranging from black to silver to rose gray and white. Other shades are mahogany brown, light fawn, and champagne. The fleece is known to be softer than cashmere or angora and warmer and lighter than wool, without any prickle factor that some wool has. 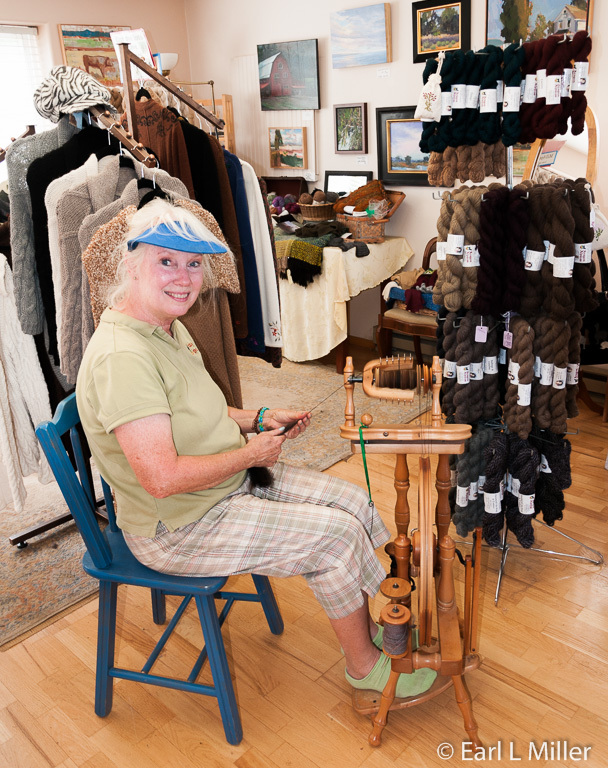 Alpaca fleece doesn’t have lanolin so it’s easier to process and hypoallergenic. The prime fiber, which is the softest, called the blanket, comes from the lower neck, throughout the body, and the upper hips. Sometimes this fleece is blended with bamboo. Ann hires someone to come to the farm in April to shear all her alpacas at one time. Lavender aromatherapy is used to calm the animals. These fibers are processed into rovings, spun into yarn, or woven into fabrics. 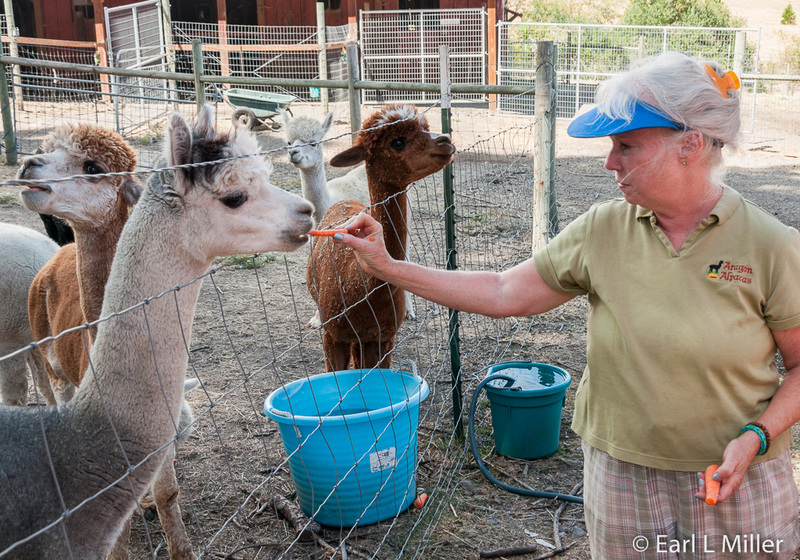 Two species are found at alpaca farms. They’re physically the same except for their fiber. Most alpacas are Hucayas, whose fleece is fluffy, like a teddy bear. Suri have ringlets that appear almost like dread locks. The fleece on both sexes, of the same species, is the same. Of the thirteen males at Aragon Alpacas, twelve are Hucayas. Ann also has 27 female Hucayas. Ninety percent of the alpacas in North America are Hucayas while only about ten percent are Suris. Alpacas have a life expectancy of 20 years. Females reach breeding maturity between the ages of 16-24 months and can breed all their lives. Males don’t reach their potency until 24 months or more. However, though it’s very rare, some males are ready to breed at 12 months. No interbreeding is allowed between species. One important task is to keep careful records of breeding lines. Ann has genealogy information on all her alpacas in order to keep track of breeding lines. Gestation is 11-1/2 months with mostly single births. It is rare for twins to be born. Females can be bred two to three weeks after delivery. Since the babies nurse for six months, females can be pregnant while nursing their young. Alpacas are herbivores, grazing on grass and munching on trees and shrubs. Ann lets hers graze in the pastures. She supplements that with hay which she obtains from a grower once a year in September or October. She also feeds all of them special pellets containing Selenium. Some also receive extra calorie-feed, too. They have multiple stomachs, similar to cows. Their three stomachs contain special secretions which allow the animals to absorb 50% more nutrition than sheep. 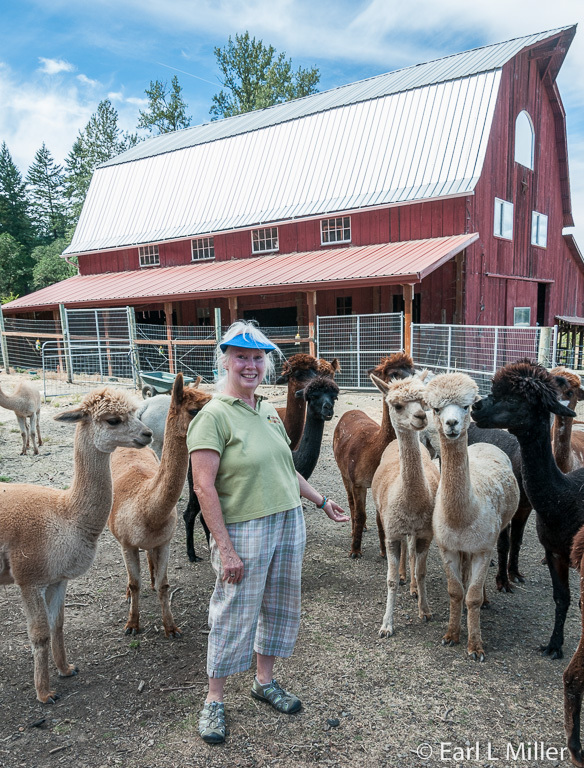 Five states have a lot of alpacas. These are Washington, Oregon, California, Colorado, and Ohio. One reason Ohio and Oregon may have so many is because Ohio State University and Oregon State University have a veterinarian department dealing with camels. After sitting in Ann’s store, learning about alpacas, she provided an opportunity for us to observe them. She even brought out carrots that she fed to them. We were offered the opportunity to feed them as well. It was mid day, so time for her animals to exchange pastures. We were fortunate to watch two parades of alpacas. We then returned to the shop, While Ann has won ribbons at shows for her alpacas, now she prefers to send their fiber instead. One reason is that it’s easier on the animals to stay home. She took time to show us how she spins this fiber. 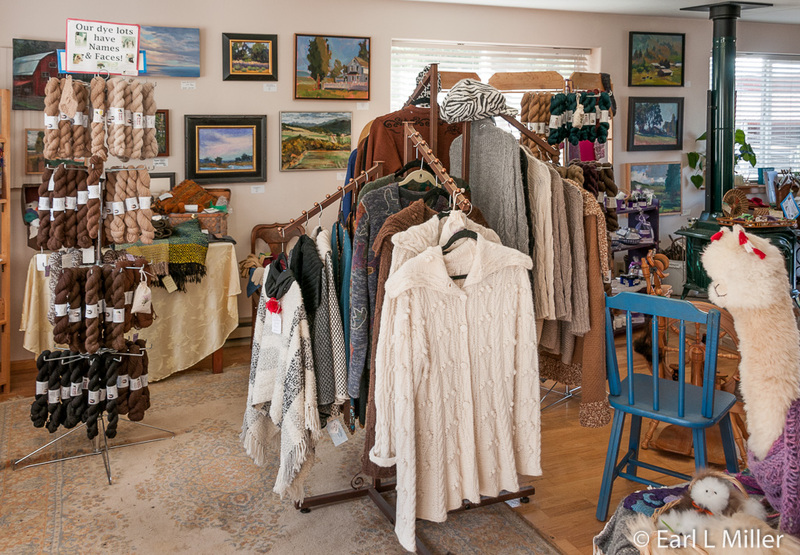 The shop sells yarn and alpaca fiber goods, from hers and other farms, and original art by Plein Air Painters of Lane County. In nearby Springfield, those who enjoy the outdoors and appreciate history can do both at Dorris Ranch. It’s a nationally registered historic site, working ranch, and public park. It’s recognized as the first commercial filbert (hazelnut) orchard in the United States, dating back to 1902. In fact, more than half of all commercial filbert trees growing in the United States trace back to the Dorris Ranch nursery stock. The ranch was first started by William and Eliza Masterson, who came over the Oregon Trail from Kentucky in 1851. In 1892, they sold the property to George Dorris, a retired attorney from Astoria, and his wife, Lulu, who wanted to become farmers. Dorris experimented with growing a variety of crops before settling on hazelnuts in 1903. Over the next 50 years, the Dorris family planted 9,200 trees at the ranch and harvested more than 50 tons of nuts. His nephew eventually took over for them. The Willamalane Park and Recreation District obtained the property in the 1970's and still owns the 250-acres today. It’s still productive as a hazelnut ranch. The nuts are harvested in September, from each of the eleven separate orchards. As hazelnuts fall from trees, their husk falls off. Machines then pick up the nuts and take them directly to drying machines. A local orchardist maintains the Dorris Ranch orchards and sells the nuts to a processor. You can tell the age of the different orchards by observing how close the trees are placed together. In the early years, the trees were planted very close together. As the years passed, spacing became more separate. Most trees are of the Barcelona variety which are self-pollinators. The DuChilly and the Daviana trees are planted as pollinators. They’re found as every third tree in every third row. The ranch is popular today for photographers and birders. You’ll also notice bikers, hikers, and dog walkers enjoy it as well. There is a 5-kilometer route through the orchard. Recently Dorris Ranch added a four-mile paved trail for bikers which has become very popular. Seeing architectural history is also part of this experience. Various buildings are present for educational purposes. Though the Masterson home is gone, you can see a replica of a 12-foot-by-16 foot cabin, similar to one where they might have lived. A nearby blacksmith shop shows how tools were fashioned, and a freight farm wagon depicts the transportation they would have used. 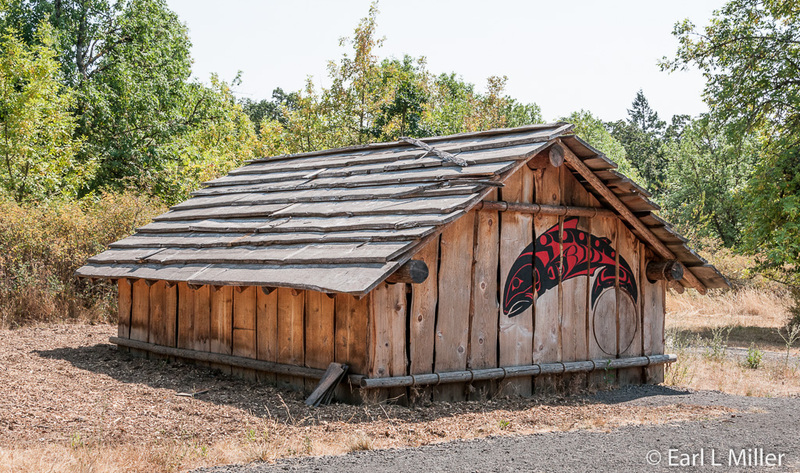 A Northwest Coast Native American plank house is also on the property. It is built of cedar planks, typical of native American homes constructed in this area before 1820. Nearby this home is a replica of an 1830s fur trapper’s cabin. A short walk leads to the Dorris house, which you can see from the exterior. For self-guided tours, the park is open from 6:00 a.m. to dusk every day, throughout the year. In October, Dorris Ranch holds a haunted house for three nights through the orchard. During the spring and fall, costumed interpreters sometimes lead walks to the various park buildings or conduct hands-on frontier activities. Although the ranch is open all year, it is best to call them to learn when special events, like a Day at the Ranch, are taking place. Their telephone number is (541) 736-4544. The address is 205 Dorris Street. Admission is free. 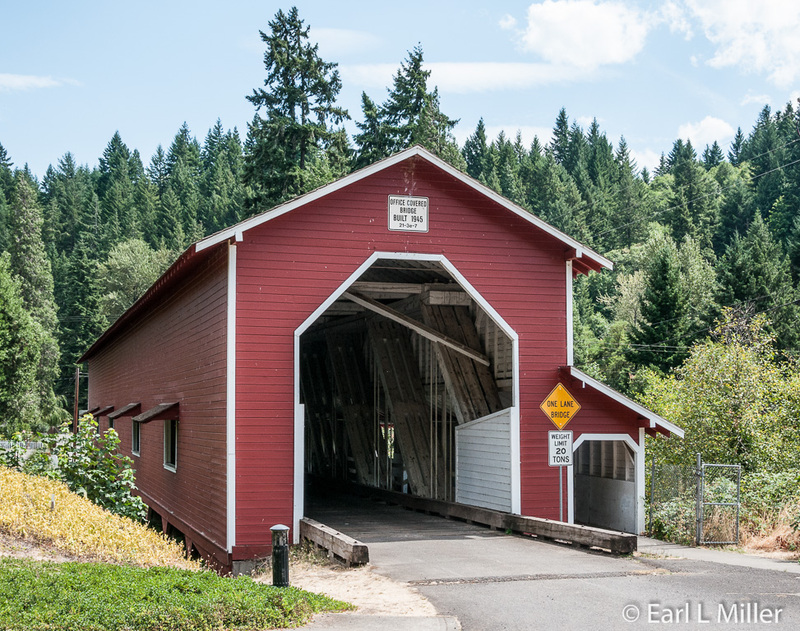 Oregon is rich with covered bridges. 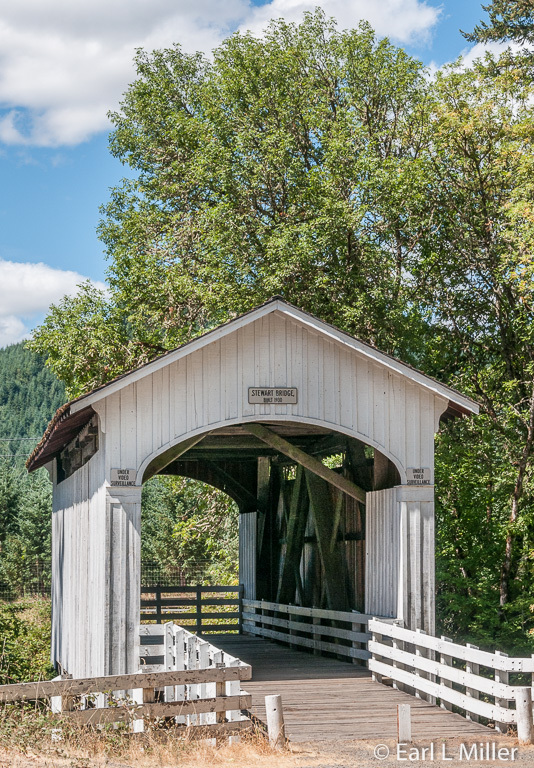 Between 1905 and 1925, it’s estimated 450 covered bridges existed in the state. By 1977, the number had dwindled to 56. With 20 covered bridges, Lane County has more covered bridges than any other county west of the Mississippi River. If you travel to Cottage Grove, south of Eugene, you can follow a route to see seven of them within about a 20-mile driving distance. Maps are available at the Lane County Visitor Center at 754 Olive Street in Eugene. Here is a quick rundown on these. Constructed in 1997 to celebrate Cottage Grove’s centennial birthday, Centennial Bridge’s materials came from two demolished Lane County bridges. It’s open only to pedestrians. Note that it is difficult to park at this bridge. You’ll find Swinging Bridge about a half-mile upstream from Centennial Bridge. It was built for foot and bicycle traffic. Mostly school children crossing the Coast Fork used it to get to school. The present one is the fourth constructed on this site. It received its name because earlier versions would swing side to side. 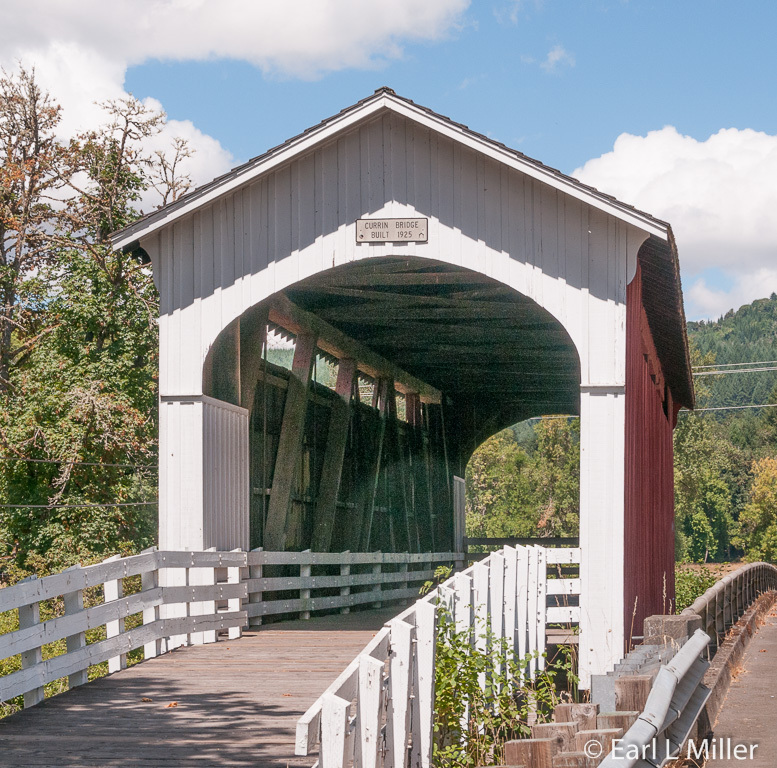 The Chambers Bridge is the only remaining covered railroad bridge in Oregon. A lumberman, J. H. Chambers, built it in 1925 to cross the Coast Fork of the Willamette River from his sawmill to the timberlands. It was in use for only seven years before his sawmill burned down. Listed on the National Register of Historic Places, the bridge was restored in 2011 as a pedestrian and bike bridge. 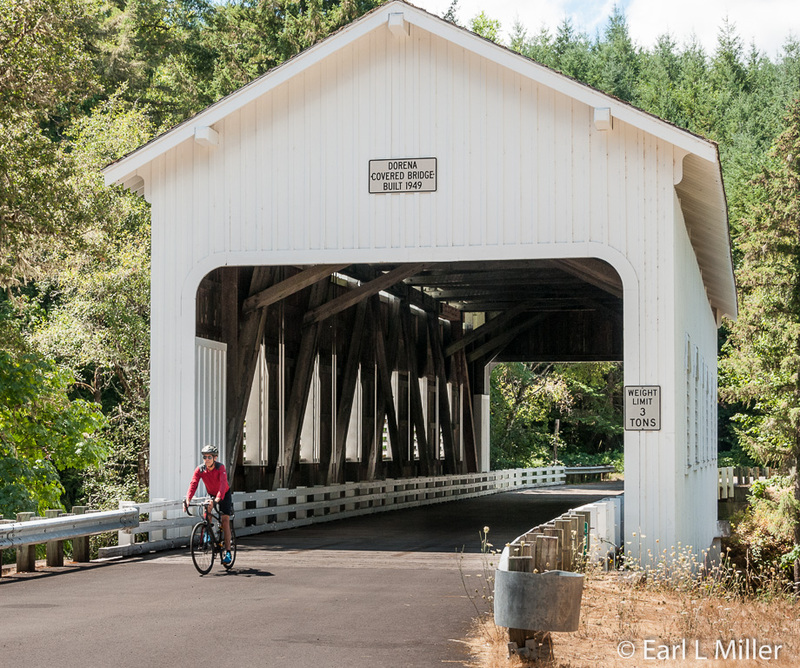 Mosby Creek Bridge, the oldest in Lane County, was constructed in 1920 and restored in 1990. Its one lane is open to traffic today. It has a board-and-batten exterior and ribbon like openings on each side’s roof line. The Stewart Bridge, at 60 feet long, was built in 1930 and restored in 1996. The deep water below the bridge is touted as one of Lane County’s best swimming holes. In 1949, the Dorena Bridge, on the Row River, was constructed after the Dorena Dam formed the present lake. The bridge was restored in 1996. It’s a popular wedding site that once tied together the north and south sides of the lake. What’s different about the Currin Bridge is that it is not all white like the others. Instead, it features white portals and red sides. It was built in 1883, rebuilt in 1925 and restored in 1995. It replaced a bridge built in 1883 by a prominent local bridge builder. Spanning 60 feet across the Row River, it has been the site of numerous weddings and special events. Another interesting bridge is located in Westfir. 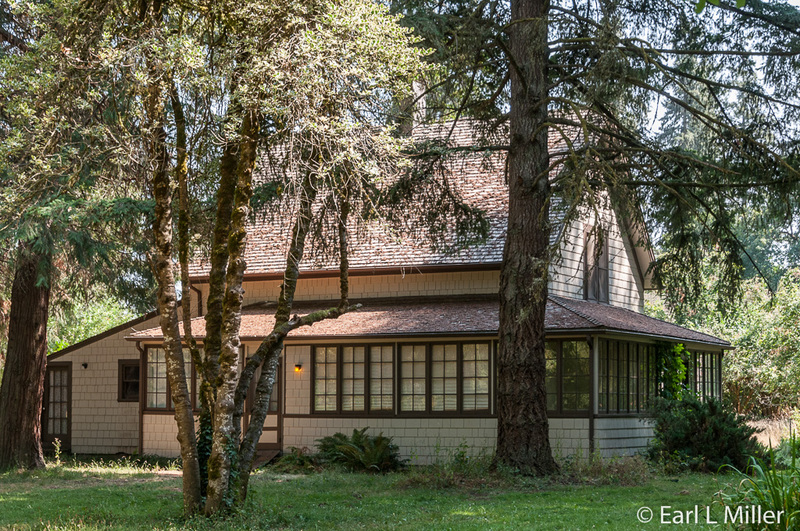 It crosses the Willamette River at the south end of the Aufderheide National Scenic Byway, at the edge of the Willamette National Forest. 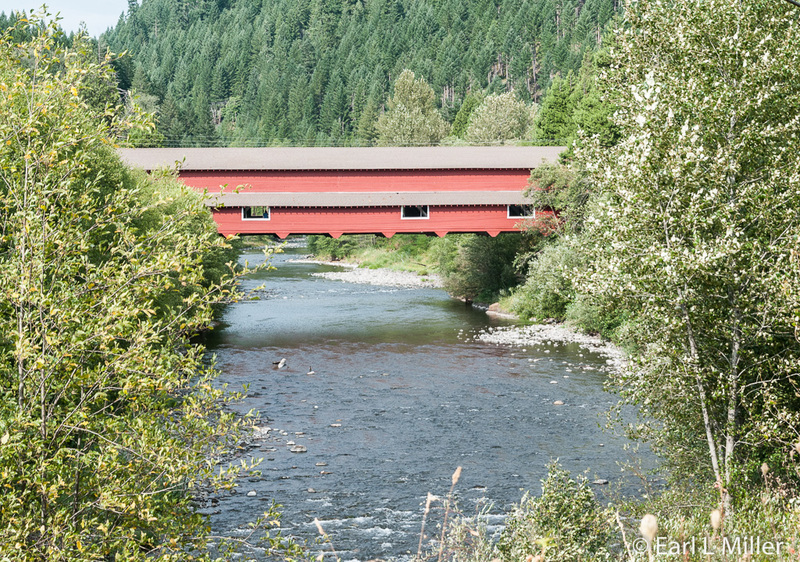 What makes it unusual is that it’s Oregon’s longest covered bridge at 180 feet. 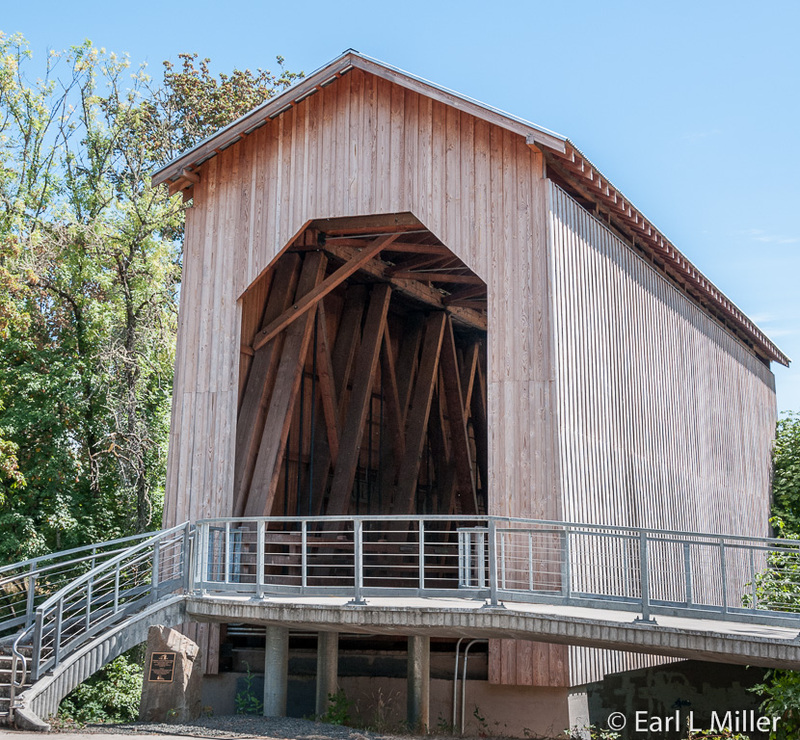 It’s one of only two in the state using triple Howe truss construction, and the only covered bridge west of the Mississippi River with a separate pedestrian walkway. The Westfir Lumber Company constructed the original bridge in 1941. They replaced it in 1944. It carried logging and lumber trucks to the company’s lumber mill and mill pond. Westfir was a company town. If you glance at the houses still remaining, you can spot that its homes have almost identical architecture. In 1977, the town of Westfir, the mill, and the bridge were sold to an investment firm. The lumber mill burned down in the early 1980s. Bridge ownership changed to Lane County in 1992 because of property tax foreclosure. In 1993, extensive structural work was performed on the bridge while in 2002, the county replaced the roof. In 2003, a small park opened on the bridge’s north side. It serves as a trailhead to the North Fork Trail, following the Wild and Scenic section of the North Fork River. There is plenty of space to park if you want to hike. 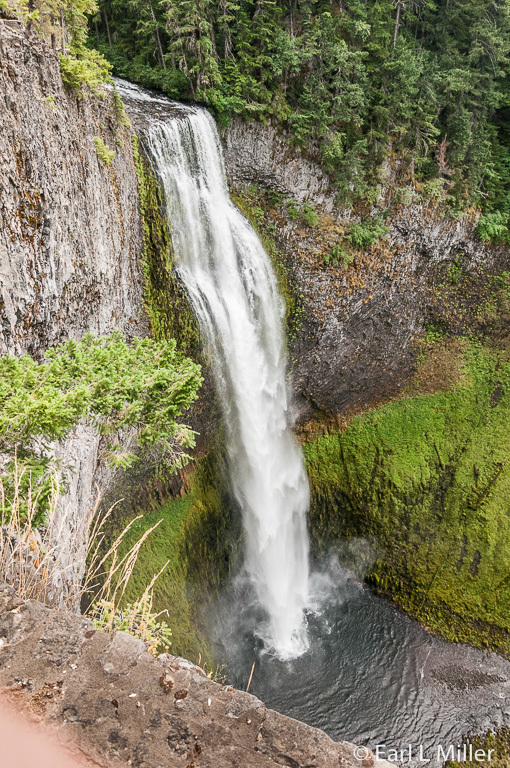 Located 21 miles east of Oakridge, just off of highway 58, you’ll find Salt Creek Falls. It’s a single drop waterfall, plunging 268 feet, second only in height to Multnomah Falls. The top viewpoint is handicapped accessible. For those who don’t mind lots of stairs, not us, there is also a trail to the falls’ base. It’s located in a day use area with a five-dollar fee. How it was formed is intriguing. Glaciers scoured out the valley during the last Ice Age. Lava flows filled in a portion of the valley after the glaciers retreated. This created narrow canyon walls, composed of columnar basalt, which are now seen. The falls hurtle over these walls into a canyon near Willamette Pass. A billboard contains information about the Black Swifts found here. The falls are one of a handful of nesting sites for these birds. Their nest is often behind the veil of falling water, through which they fly to get to their nest. These birds are bigger than swallows. The best time to see them is just before dark, when they feed the chicks and roost for the night.